– A water bottle: There will be Reverse Osmosis water stations (thanks to Donamarc Water Systems), so bring a reusable water bottle to fill up. Or you can purchase a collapsible water bottle at PorchRokr. – Cash to tip performers: Hear something you like? Tip the band! – Portable phone charger in case you run out of battery from filming all those videos, Snaps, etc. – Comfortable shoes to get you around to see all of the vendors and musicians. – A friend! Bonus points if they’ve never been to Akron or PorchRokr before. Please look for the recycling, compost and garbage receptacles to dispose of your waste. Residents, please leave your recycling and garbage bins on the curb. If you live on the PorchRokr route and want to make some extra money, you can sell stuff on your lawn. So set up that yard sale you’ve been putting off all summer, or let the kids sell lemonade and cookies. Coming to PorchRokr from outside of Highland Square? There will be street parking available as well as some parking in business lots. Look for signs telling you where to park and where to NOT park. 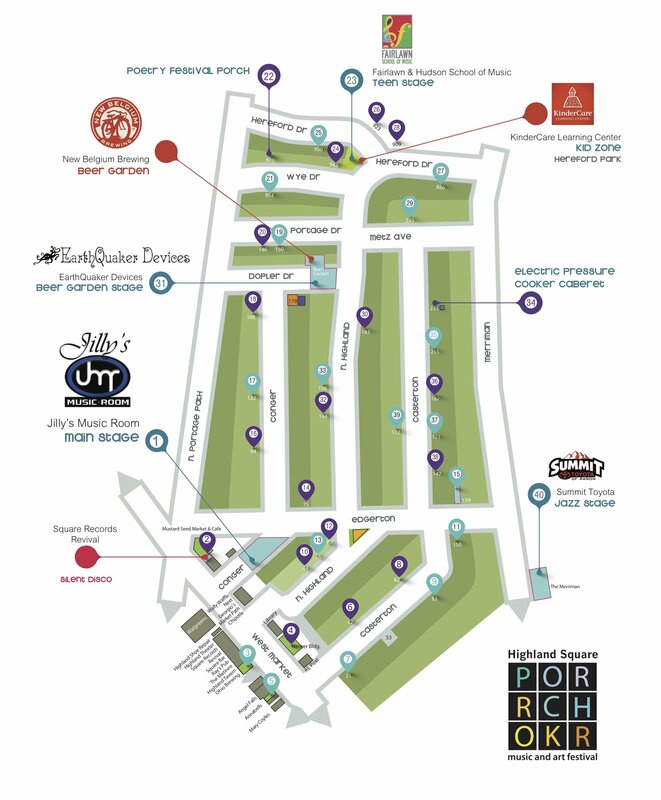 Summit Cycle will have a bike share at this year’s PorchRokr festival near the N. Highland Ave cul-de-sac. Adult sized bikes will be available for use at the festival. Bikes will need to be signed out with a driver license or state ID. Suggested donation is $5. Is sustainability your thing? PorchRokr will provide several opportunities for DIY education this year. Let’s Grow Akron will teach you everything from composting to seed saving to upcycling plastic bags. Workshops will all take place in the triangle park at Highland and Edgerton. See the workshop times listed below. For the updated map with legend, look here.